I love watching movies or reading about a second chance romance! Maybe that’s why I wrote a book about a couple who met again after thirteen years of being apart. Did their love ever die? Was it meant to be? The townspeople in my small town of Canyon Junction think so, and everyone is rooting for Jake and Beth. This week Whispers of Forever: Mending Christmas is over at StoryFinds for their Second Chance Romance Theme Week. Along with the book promotion, Whispers is also in a cover contest. I know, I know, I said I wouldn’t do these cover polls anymore when I had to ask for reader votes, and I haven’t for a few years. The pages are slow-loading, so be patient. At StoryFinds, the site owner does a lot of promo for the cover poll. With a new release in this series, I wanted to do a bit of promo for the first book too. If you’re up to visiting the Theme Week Cover Poll, here is the link. 🙂 I’ve also included an excerpt from Whispers of Forever: Mending Christmas. There is also an excerpt to go with the promo on StoryFinds. What can get in their way this time? Beth removed his arm from her shoulder and leaned against his truck. “A lot of things have changed. We’ve changed. But it didn’t take long to know a part of us hasn’t.” She smiled and his heart skipped a beat, for she said what he had been thinking. “I’ve noticed.” Jake gave her a cocky grin. “No way. Wasting all the good cooking she used to do? You still like steak, Macaroni? Because I got a grill.” So much for being unsure of spending time alone together, because now it was all he could think about. The magnetism began to sizzle in a heartbeat, or it had never left. Jake licked his lips, moving in closer. He wanted to kiss her so damn badly. “All right. I’ll follow you to your house.” For a moment, their gazes held, and it took all he had to pull away. If he didn’t know himself better, he’d swear he was shaking. Being close to her, smelling her, caused a rousing he wanted to let loose. Jake slipped his arm around her shoulder, and he had a hard time swallowing. He opened her car door. When she got in and glanced up at him with those shamrock green eyes, his heart ached. Not a heartache, but an ache in his heart because that quick, he wanted her in his future. Enough time had been wasted between them, when it should’ve been them, all along. “Want to know a secret?” Beth held the door from closing. “Our kids with the same name would’ve been fantastic in such a freaky way.” He nodded and went back to his truck. Jake drove behind her all the way, and as they drove down her road, that big old Superstition Mountain to his left reminded him of the many nights he drove that same road to pick her up for a date, and then the last time, to run away with her—to marry her. What would’ve happened if that night had taken place? 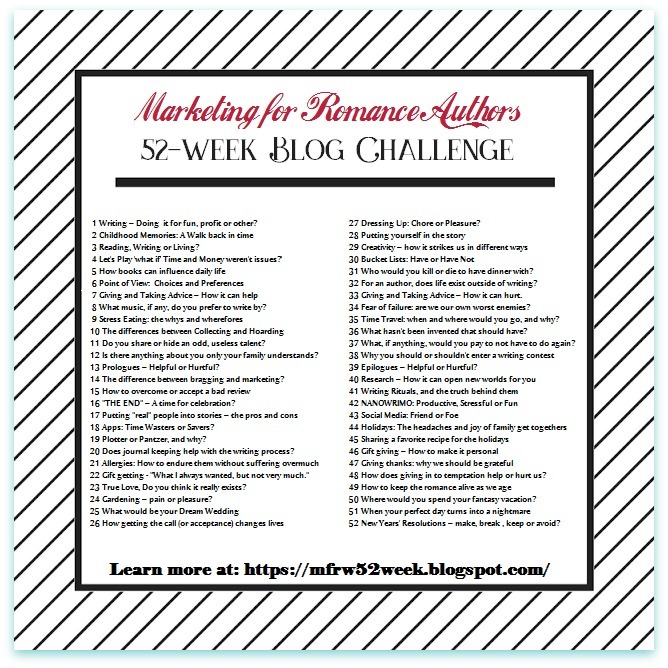 Now that we’re counting down weeks in the #MFRW 52-Week Blog Challenge, it seems the weeks are speeding by. Christmas decorations are in the stores. I bought some yesterday Oh, my! Again, here we are with another Friday post for the Blog Hop. This week’s topic messed with my heart. I had to make the decision whether to skip this week or go for it. It’s too soon to write much about my fur baby girl, Kasha. I’ll briefly mention her, but after that, I’ll mention my three grand-kitties. Clancy, Zuko, and Sokka. Kasha was an Australian shepherd mixed with chow. She weighed about sixty-five pounds in her good days. My son got her from a shelter. Her age was around ten months old. Jim knew they were a match from the moment he saw her. Me too. When he’d go visit her the few times before taking her home, they told him she’d jumped or climbed over one of their six-foot-high fences. She hated being cooped up in a room or kennel. We didn’t know her history, so we understood it had something to do with her past. Every time I’d visit them my heart melted a little more, but then it broke when I’d have to return to my home across the state. Eventually, I moved in with her and my son. Kasha and I moved into an apartment a little over two years ago, but we were together almost 24/7 for the past seven years, and on and off for seven before that. When she could still take walks, we had a nice area on the grounds here. The place where she’d been cremated, had made a ceramic plaque with her name and a paw print. The vet also sent us a sympathy card and included a poem that I won’t be able to look at again for many years to come. It’s called Rainbow Bridge. She was fourteen. Between the two of us, we gave this sweet dog a good life, and she sure gave us one, too. It was meant to be. Well, now look at this. I managed to write more than I thought I could. The image right above is the same one on my book cover for Whispers of Forever. Click on the cover in the gallery in the sidebar to enlarge. I’m so happy that I wrote her into one of my books where she will live on in the story. I guess he wanted to go outside. Clancy is fourteen years old and my oldest son’s cat. They live in California. He and I both searched our old computers for the pictures above. I couldn’t find mine. He did! ❤ I love the picture of him in the cereal box. His ex-wife brought the cat home one night. They already had another very old cat named Boots. The wife left. Clancy remained. The only experience I’ve had with owning a cat took place briefly when I was a teenager. A black cat came to our house one Halloween, stayed a week, and disappeared as quickly as he had appeared. Clancy is in camo in the above picture. 🙂 He has free rein of the neighborhood since he has a cat door to come and go as he pleases. Clancy is a typical cat, and from my experience, he doesn’t take to strangers. He’s crazy about Chris, you know, in a cat way. I don’t know how Clancy is with my son’s girlfriend. When I visit, it takes forever for Clancy to get close to me. It’s my fault because I don’t visit often enough. He’s true to his owner, though, and often brings him lizards and birds. Isn’t that sweet of him? When my son goes away, Clancy enjoys bringing gifts to cat-sitters, too. I guess he’s in and out all night, so he curls up in blankets on my son’s bed and sleeps there on and off during the day. Meow. On the prowl for lizards? Okay, you can tickle my belly. Meet My Grand-kitties Zuko and Sokka. Huh, wait, where are they? Well, their mom and dad are still on their honeymoon, and haven’t sent me pictures yet. (By the way, son and DIL experienced TWO hurricanes while in Ireland. Now they’re in Washington, D.C.) Zuko and Sokka started out as my daughter-in-law’s kitties. She had Zuko first, but she got Sokka for Zuko so he’d have a buddy. Maybe it’s the other way around. They became attached to my son in no time. It was like they knew that if Mama loves him, then he can stay. They are males and they’re both black. I can barely tell them apart. Zuko is a lot longer than Sokka. Zuko is kind of social with strangers, more than Sokka. In fact, Sokka hides and rarely comes out if anyone besides my son and DIL are in the house. I cat-sat for a week once… I didn’t see Sokka for the first few days. They survived their move to Virginia, but I don’t think I’d want to be in the car with them for a long ride. I’ve been told the boys can be a noisy bunch when in their carriers. I’m excited to see what kind of pets (furry family members) the participating authors have. Join me in visiting their sites. Thanks for reading today. Have a terrific weekend. Let me explain. I dislike the topic for the sake of my blog followers because I’ve written about my first love before. I don’t want to bore you with another mention with this week’s topic. However…I love the topic because I still communicate with him now and then. We have communicated on and off since I was sweet sixteen, but there were a lot of years in between that we didn’t. A couple of my books are dedicated to him. No, he isn’t an ex-husband. He isn’t the father of my children. We stay in touch because we’re friends. So, hmmm, what can I write about this week? How about this? I used to write poetry for him. He loved that. The other morning I searched for poems I had written many years ago. They are nothing but silly teenager-in-love poems. I have to laugh at some of them. You won’t see those, but you can read one. Laugh if you will, but come on, give me a break. I was young and in love. Are y’all done laughing? Forgive me? Okay, that’s enough mush and sap for today. I should’ve skipped this week. Geez! Since the topic is about first love, I can’t end this post without mentioning one of my books is about first love and second chances. Yep, it’s Whispers of Forever: Mending Christmas. I enjoyed writing this book. This is book one in the Canyon Junction: Hearts in Love Series. Finding Kimber, book two will be out before the end of the year. This series is a spin off to the Double Dutch Ranch Series. Let’s go see what the other participating authors wrote about. Is it too early for wine? If you’re still this far in the post, thanks for sticking it out to the end. Previously, I had mentioned my youngest son and daughter-in-law had to postpone their honeymoon for several reasons. Well, last Friday, they boarded a plane to Ireland. Little did they know they’d experience Hurricane Ophelia. I have been calling it their Hurricane Honeymoon. Unfortunately, there were deaths, damage, and millions without power. We hadn’t heard from them for over twenty-four hours so both families got a little worried, but then they checked in saying they were okay. Their travel agency had kept in contact with them to be sure they were safe. They’re still traveling through the country. The family has been keeping in contact via a private Facebook Group page my son set up. Both of us moms are happy when we know what they’re doing and where they are. Oh, and today is their first anniversary and they get to celebrate it on their honeymoon! Hi, Folks! Not long ago, Jacquie Biggar shared my book, Christmas at Love House: A Bittersweet Interlude. The other day, she shared my newest release, Whispers of Forever: Mending Christmas. Well, to me, this is Inspiration for my Muse. Thanks again, Jacquie! Hop on over to visit Jacquie and see what she has up on her site today. My book was shared on Thanksgiving Day, but I didn’t want to bother y’all with promo on that day. Jacquie is a U.S.A. Today Best-selling Author. Jacquie has a lot of her own work in book bundles with other fantastic authors, plus, she writes novels. She writes Romantic Suspense with Attitude. You go girl! I’ve been cyber-traveling! Today I’m over at Romance Lives Forever Blog. This blog was created by Kayelle Allen, who is the founder of Marketing For Romance Writers.org. I think I’ll be here on December 3rd, too, but I’m not sure if that is an error. Yep, you got it. Today at #RLFblog I’m showcasing the same book. I wouldn’t mind having you visit. You can see who my favorite book hero is. Not my own, darn it. 🙂 Oooh, but I probably couldn’t choose my own. It was hard enough to choose another one. Guess what? He isn’t a cowboy! But, he probably ended up with a cowboy hat sooner or later. Thanks for visiting. Check out the links because Jacquie, and the Romance Lives Forever Blog, share tons of books on their sites. What can stand in their way this time? Rancher Jake Lawton never expects to become a single dad to his nine-year-old overnight. However, one last malicious act his wife had done before leaving them, could affect both he and his son’s lives. By chance, he runs into his high school sweetheart, never expecting the same old yearnings to return with one “How are ya?” embrace. Has their unanticipated meeting arrived at the perfect time, or has years apart put an end to what should’ve been years ago? Beth Marconi arrives home to help care for her ailing father. In town, she inadvertently runs into her first love—the cowboy she nearly married after graduation. Sparks ignite before they say hello, but how do they start over when life has left them so bruised? When her ex comes to town, she’s forced to explain the secret surrounding her short-lived marriage. Is Jake the kind of man who will understand, or will he revert to the hell-raiser he had become when Beth left thirteen years ago? Filled with both anguish and hope at Christmastime, a young boy and two lonely hearts pursue a second chance. Author Note: Canyon Junction is the fictional small town where our cowboys from the Double Dutch Ranch series live. In this new series you’ll meet friends, acquaintances, other people who reside in Canyon Junction, and anyone else who may amble into town. 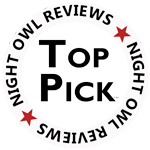 Remember how important reviews and word of mouth are to authors. Thank you for stopping by today! Have a rocking weekend. Yes, that is my dog on the cover.